MACON, Ga.--(BUSINESS WIRE)--Southern Spine, LLC, an ISO 13485:2016 certified manufacturer of implants and instruments for spinal surgery, announced today the release of three (3) new StabiLink® Dual Lamina Implants specifically designed for upper thoracic clinical use. Alan H. Daniels MD, Associate Professor of Orthopaedic Surgery at The Warren Alpert Medical School of Brown University has specifically used the StabiLink® Dual Lamina constructs as an adjunct to long segment, pedicle screw deformity constructs to help prevent proximal junctional kyphosis (PJK) and proximal junctional failure (PJF). Dr. Daniels has recently published a case study titled “Severe Sagittal Imbalance Correction” where he uses the StabiLink® Dual Lamina Implant to create a transition zone at the upper instrumented vertebra (UIV) and UIV+1. In the case study, Dr. Daniels states, “For PJK prevention, an interlaminar flared construct (StabiLink® Dual Lamina, Southern Spine, LLC, Macon, GA) was placed. This strategy may be more robust in some cases than ligamentoplasty, and is easily and rapidly applied.” Dr. Daniels’ clinical data will be presented at the upcoming International Society for the Advancement of Spine Surgery (ISASS) conference April 3-5 in Anaheim, CA. The data highlights recent clinical outcomes utilizing the StabiLink® Dual Lamina Implant on sixteen (16) deformity patients for PJK prevention with follow up ranging from two (2) months to over one (1) year. 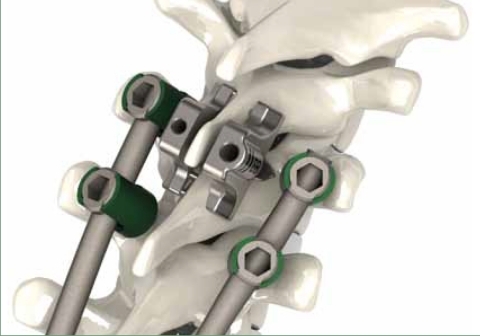 The StabiLink® MIS Interlaminar Spinal Fixation System has been successfully used in thousands of clinical procedures. You can get a “Hands On” demonstration of the innovative StabiLink® MIS Interlaminar System at the upcoming AAOS Conference at Booth #628 or at the ISASS Conference at Booth #403. Southern Spine releases three new StabiLink Dual Lamina Implants for Thoracic use. StabiLink is the perfect adjunct to pedicle screw fixation.